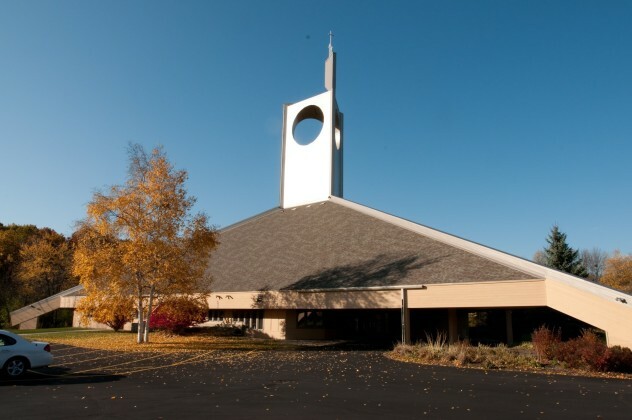 When architect Helmut Ajango set out to design a new church for Memorial in the mid-1980s, he asked members to write down their sense of what the church should represent. Their sense of a place for worship, for education and for social life is reflected in the design of our building. Our two additions to the original building extend those concerns — the music wing helps us enhance our worship experience and the youth wing extends our programs for education and social life. The music wing, built in 2001, includes a section for the church’s archives. The youth wing, built in 2006, includes offices for the associate pastor and parish nurse. In the main part of the building, in addition to classrooms, Fellowship Hall and a kitchen, we have a library and the main offices. The windows in the sanctuary look out into the world as the three circular skylights open us up to God as they bring in the light from above. The tower that reaches up 100 feet has three sides with a circle on each side with three crosses on the top, reflecting the three crosses on Calvary where Jesus died. More than 80 people put at least 15,000 of labor into the construction of the building in 1988 and 1989. The communion table, pulpit, cross and baptismal font in the sanctuary were made by Jim Tetzlaff, a member of the congregation. He also built the desks and cupboards in the main office. The 7.2 acres on which the church rests is the terminal moraine, the area where the glaciers stopped. The woods behind our building provide both a beautiful backdrop to the sanctuary and a wonderful place for quiet walks. We have planted special trees in honor of the volunteers who helped make this church building a reality and in memory of members who have died. If you are interested in using our church building for a wedding or other social event, you might be interested in looking at our building use policies and at the costs included on our building use form.